Acer just had its annual hardware vomit: from laptops and tablets to PCs and wearables. Most of the stuff involved incremental updates, gaming gear that looked more like alien architecture, and something called a GrandPad that is a tablet for old people (and not adult diapers). But there were other glimmers of cool, and this is the stuff we’re excited about. What is it: The name keeps getting more ridiculous, but the Alpha 12 is Acer’s attempt at cashing in on Microsoft’s Surface success. It’s got the expected trappings of a tablet-laptop hybrid. There’s a kickstand, an included pen so it can take advantage of Microsoft’s new Windows Ink platform, and a clicky keyboard that comes with it gratis. QHD? Yep. USB-Type C? You betcha. Latest Intel CPUs? Most definitely. Why we like it: Where most Windows PC makers are more than happy to just carbon copy the Surface to create their own 2-in-1s, Acer is at least bringing one new idea—liquid cooling. This thing packs in a 6th-generation Core i3, i5 or i7, the most powerful consumer CPUs that Intel makes and with that power comes heat and lots of it. Surfaces use traditional fans to keep the chips cool, but Acer held onto its fanless design by instead packing in a liquid cooling system that keeps the chips running smoothly. The result is an aluminum exterior, uninterrupted by a fan grills that only costs $600 bucks. Seems cool! What is it: Acer’s best known for creating budget-friendly machines, and when it comes to more pricy gadgets, Acer’s considerably pulling up the rear. The Aspire S 13 wants to be Acer’s more flashy clamshell for those with a little bit of extra scratch. Why we like it: Windows makers have been encroaching on Apple territory with renewed zeal in the past six months with Microsoft’s excellent and pricey Surface Book and HP’s super-luxe Spectre launched earlier this month. Acer takes on that trend in laptop opulence with diamond-cut edging around the touchpad and a glossy metal hinge. At 0.57 inches it’s not quite as thin as the Spectre, but its by no means a beastly machine. It’s also a cool $400 cheaper than the comparable competition, starting at $700. What is it: Acer’s far from a household name in the States, but when it comes to Chromebooks, the Taiwanese company famously knows what its doing. That’s why the Chromebook 13 is one of our favorites when you need to get some real work done. The Chromebook 14 has as huge collection of configurations, with the top-of-the-line topping out at Core i3 with a full HD display, 32GB storage, 8GB of RAM, and backlit keys. With a promise of 10 hours of battery life (12 hours on the HD version), it’s a good spec layout for a Chromebook that starts at $350. Why we like it: For us, the Chromebook 14 comes down to looks and potential. This guy actually has a panel of Corning Gorilla on the backside of the device. It gives the Chromebook a kind of Samsung Galaxy S7 finish on it (though it does become a fingerprint problem for the more OCD of us). 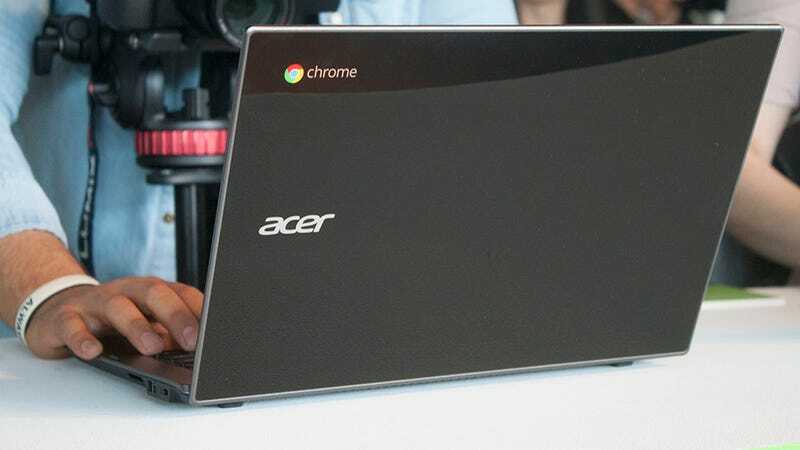 Being as this is primarily geared toward businesses, Acer envisions companies wanting to brand Chromebooks with logos behind that sheet of glass. Cool, but it would be waaaaay cooler if Acer worked up a customization portal, similar to Motorola’s Moto Maker, where people could build personal systems. Unfortunately, that’s not happening with this generation. Regardless, it’s a very neat-looking Chromebook that’s got some great potential.